electric cars, plus one heavily wrapped pickup truck with a Ford F-150 body. Tesla has used the body of other vehicles for its test mules in the past. the testing facility? Such a scenario is not implausible. the photo of the vehicle). Tesla Pickup Test Mule Caught In The Wild! Do I deserve my new Tesla electric car? 2019-03-08 So, the question still remains: Do I deserve an electric car? > Tesla has used the body of other vehicles for its test mules in the past. > the testing facility? Such a scenario is not implausible. > the photo of the vehicle). > Tesla Pickup Test Mule Caught In The Wild! > Do I deserve my new Tesla electric car? > 2019-03-08 So, the question still remains: Do I deserve an electric car? a 'mule' test vehicle, where all the 'secret stuff' is mostly under body? can see anyting from it. Especially underbody. > it have a tailpipe? > > Tesla has used the body of other vehicles for its test mules in the past. > > for the vehicle. > > the testing facility? Such a scenario is not implausible. > > the photo of the vehicle). 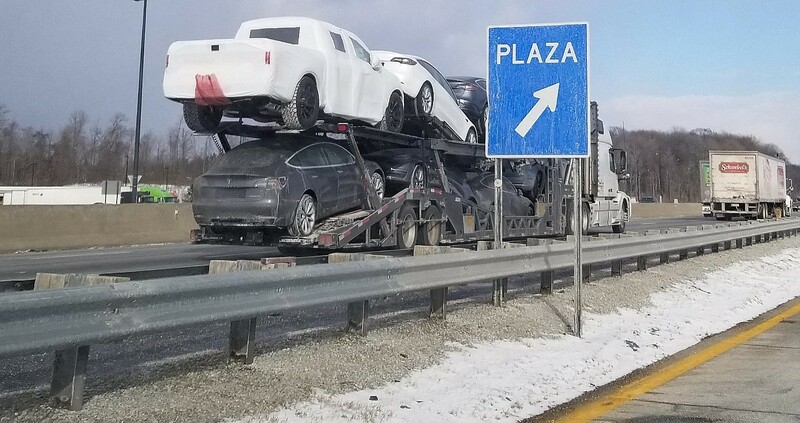 > > Tesla Pickup Test Mule Caught In The Wild! > > Do I deserve my new Tesla electric car? > Why heavy camouflage a 'mule' test vehicle? Correct, it’s not. It’s just a normal Roush F150 being delivered to a customer somewhere. Just because it’s on the same trailer doesn’t mean it’s being transported for the same customer.